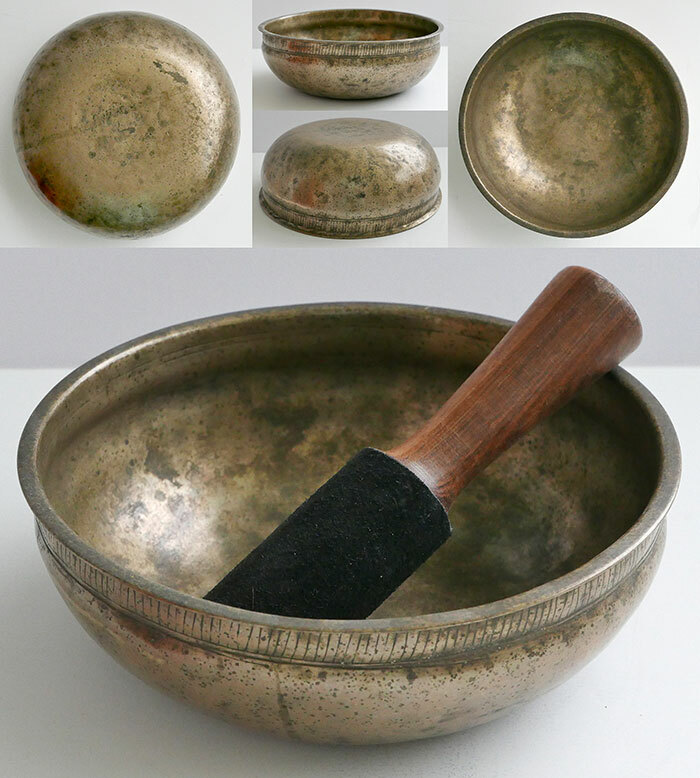 Talking bowls are singing bowls with an added dimension…the ability to make strange sounds when partially filled with water and rocked back and forth after striking with a mallet or playing around the rim with a ringer. These sounds are quite evocative, bringing to mind creatures of the night, or wolves, or resonances from the spirit world. Very few singing bowls are capable of producing these sounds, and those that do are often Thadobati or Manipuri. One simply has to experiment with every bowl, using varying amounts of water to see which, if any, talk. Sometimes engraved circles inside the bowl act as markers and indicate the precise amount of water needed…try tilting the bowl and filling the space between the circles with water! In all other respects talking bowls are normal singing bowls, but this fascinating extra dimension is associated with trance inducement and is therefore of special interest to shamanic practitioners and others with esoteric interests.